CCTV design and manufacturing company, 360 Vision Technology, have helped to safeguard the recent 1916 commemoration parade through the streets of Dublin, with the company’s Predator and Centurion all-in-one PTZ cameras deployed to provide high definition public safety CCTV along the entire route of the parade. The centrepiece of the Easter Sunday State Commemoration Ceremony for the 100th anniversary of the 1916 Rising, the parade saw hundreds of thousands of people lining the streets of Dublin for the largest public commemoration in the history of the state. After wreath-laying ceremonies at Glasnevin Cemetery and the Stonebreakers’ Yard in Kilmainham Gaol, the parade made its way along a 4.5Km route via St Stephen’s Green and Dublin Castle, to the General Post Office (GPO) on O’Connell Street. With over 30 years experience, Mongey Communications of Naas, Co Kildare, an expert provider of radio communications, audio visual, CCTV and access control solutions, were challenged to provide a managed package of services for the commemorations. In addition to the mix of 22 360 Vision Technology PTZ cameras, the package included a temporary fibre-optic network to relay all audio and video feeds, a dedicated CCTV control room for event and emergency services, 37 large outdoor truck / trailer mounted LED screens, audio provision, radio microphones for the principal participants and performers, audio mixing facilities including feeds to broadcast TV, and a city centre wide digital two way radio network. To fulfill the brief to ensure security, public safety and the event’s safe passage through the city, Mongey Communications planned to relay footage from the 360 Vision Predator and Centurion HD cameras, to the Office of Public Works CCTV control room – where emergency services commanders and event directors planned to monitor the route every step of the way. “With such a large crowd expected on the day, we were required to provide the best possible high definition footage and control,” explains Kevin McGrath of Mongey Communications. “We had used 360 Vision Technology Predator cameras on many of our installations in the past and experienced great success with them, both in their image and build quality, and the support we’d received from the team at 360 Vision Technology. “Additionally, because this was a temporary system installed to provide surveillance coverage of the 4.5Km parade route through the city’s streets, we needed ultimate confidence in the technology we chose to employ. We had a limited time period for installing the 360 Vision Technology Predator and Centurion cameras, and CathexisVision Video Management System and NVRs – involving the closing of roads and pedestrian routes. This meant it was highly important that the technology we selected worked straight out of the box and integrated seamlessly into the existing network infrastructure. The Mongey Communications team installed a mix of Predator HD cameras, many with a combination of integrated white light and infrared LED illuminators. “The Predator cameras not only have the build quality and imaging performance we needed, but also the built-in lighting options we were looking for,” continues Kevin. “The infrared lights option provided outstanding night-time performance which meant operators could monitor and record footage of the highest detail – even into the hours of darkness. 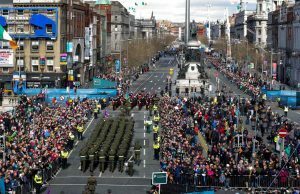 The culmination of a series of centenary commemorations organised by the Irish government, on the day, no major incidents were reported, with operators in the control room keeping a watchful eye on parade’s participants and the many thousands who turned out to watch the event. The poignant parade passed smoothly through the city, protected by 360 Vision Technology and Cathexis Europe throughout. Irish President Michael D Higgins led the main ceremony on O’Connell Street as the Irish tricolour was lowered at the GPO. The 1916 Proclamation of Independence was then read in a re-enactment of the declaration of independence the rebels made outside the GPO on 24 April 1916.